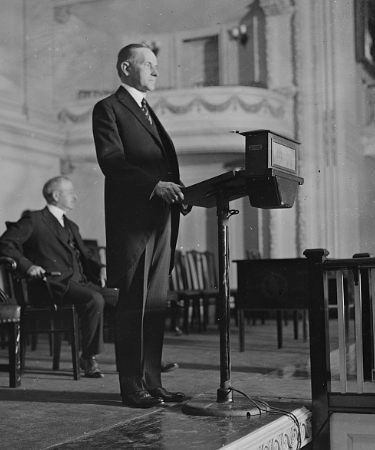 As a high school student at Black River Academy and as a college student at Amherst College, Calvin Coolidge studied rhetoric and participated in debate–and excelled in both. He later said that the experience helped prepare him for his career in law and politics, and instilled in him the importance of civil discourse, public policy, and service. The Coolidge Foundation is setting out to find the top high school debaters in America. Our premier tournament each year is the Coolidge Cup, a national debate tournament that attracts top debaters from across the country to President Coolidge’s historic hometown of Plymouth, Vermont, to compete for the prestigious Coolidge Cup, along with the $7,500 Robert L. Luddy Coolidge Cup Scholarship. The tournament takes place each year during the week of the Fourth of July, and the Coolidge Foundation covers all travel and lodging expenses for debaters. The Coolidge Foundation also offers instructional programs for high schoolers with various levels of debate experience. Our Introduction to Debate program is a one-day field-trip style experience held in Plymouth, VT, that teaches students the basics of debate. Our Advanced Debate Camp is a multi-day debate camp experience held in Washington, DC, that teaches students advanced debate skills. Finally, the Coolidge Foundation helps to build and grow debate leagues around the country. Our first league is the Luddy Debate League, a Coolidge Debate League located in the greater Raleigh area in North Carolina. If you would like to bring Coolidge debate to your region and have a group of schools that would be interested in building such a program, we would love to hear from you. For questions or inquiries about the Coolidge Foundation’s debate programs, contact Debate Director Jared Rhoads (jrhoads@coolidgefoundation.org) or call 802-672-3389.